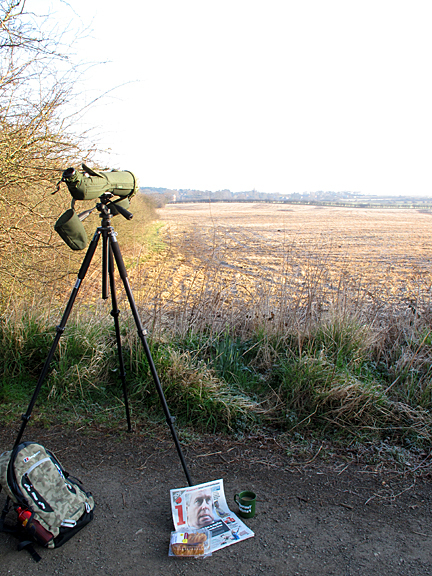 The best morning out on the patch for ages. I've had some crackers recently so this gives you an idea of how good it was. Only ones species concerned too. 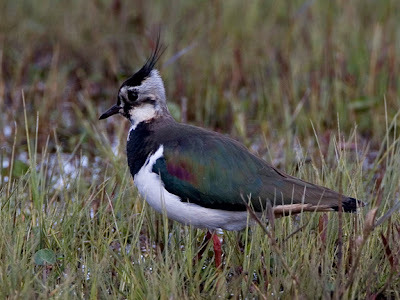 Lapwing. The cat wakes us up at 6.30am by nibbling my wifes hair. This I find rather funny, strangely she disagrees. The cat's poor behaviour is re-inforced as I get up to feed her. She likes breakfast. Who doesn't? My breakfast would usually be coffee, danish pastry accompanied by the puzzles section of the paper before cycling to work. It changes occasionally. Sometimes I have a regular coffee, sometimes a caramel latte ( decaf, extra large, low whip, no foam, choc sprinkles). I decide to pack the breakfast and get in early and out onto the fields for a spot of birding and what a morning it turns out to be. Cold, frost on the ground but bright. Real warmth in the suns rays on my face. I call into the office and brew up. I carry the steaming decaf flat white to my watchpoint, set up the scope and break out the danish. This is brilliant. Maple and pecan lattice going down a treat and plenty on show in the field. 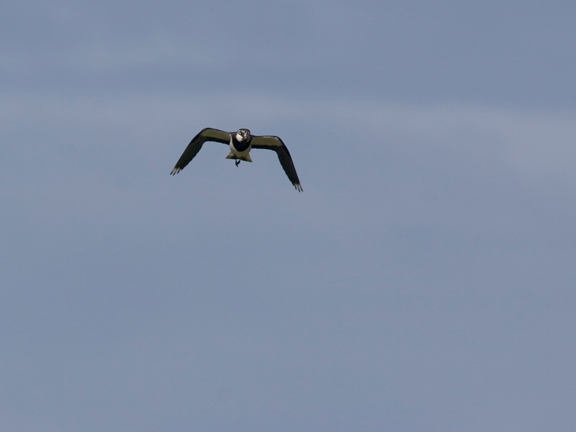 Lapwings a-plenty! I scan across and count 22. I fix on one striking male, strutting around looking resplendent in the morning sun. Irredescent colours on his flanks. Green, purple and gold. Then a flash of burnt orange as he dips to the ground, resting on the "elbows" of his wings and flashing his undertail coverts at a passing female. This looks a little comical but he is deadly serious. So earnest and strained are his displays that I fear he is going to burst something! He displays to 3 different females and tries to couple with 2. When he is unsuccessful he flies up and starts his tumbling display flight, giving his cool laser gun call before landing and standing tall, chest puffed out, head crest erect. This is happening all over the field and I watch this soap opera unfold in front of me for 20 minutes straight. Coffee is stone cold now but who cares? My original male is now demonstrating his nest building skills to the watching females, bending down to pluck blades of grass from the erath before tossing the over his shoulder. The girls are still unimpressed so it's up into the air for some more acrobatics. Weather and wildlife have come together to create a fantastic show. Who needs breakfast TV? It is at this moment that I resolve to have as many breakfasts with as many species as I can out on the patch. So it is at 8.30am on the 8th March 2011 that the Breakfast Club is born. First members of the club are Dee Birder and the Lapwings of First Field, Thurstaston.